Food festivals all over are making room for and celebrating women chefs, farmers, mixolgists and sommeliers and Hawai’i’s third annual Food and Wine Festival in Maui and Oahu, Sept. 1 – 9 isn’t any different. Celebrity Chef Anita Lo was the only female chef invited to prepare a tasting at the festival this week, but she joined other women chefs for a special brunch Girls Got Game +1 Sunday, Sept. 8. Anita is one of Bravo TV’s “Top Chef Masters” and she has earned a titanium star for being not only the first female chef to compete on “Iron Chef America,” but she had the audacity to be one of the few chefs to defeat fellow New Yorker Chef Mario Batali. Anita and many other women chefs cooked up locally grown and born and raised produce, poultry and meat by women farmers at the all-girl affair at the Hyatt Regency Waikiki Beach Resort and Spa (2424 Kalakaua Avenue, Honolulu, Oahu, 808-923-1234, Waikiki.Hyatt.com). Girls That Roam caught up with the worldly chef Anita during a pit stop in New York in between gallivanting around the globe to chat about women chefs and her culinary and global adventures. The special attention on women chefs is a blessing and at the same time a very perplexing and complicated issue. “The fact that there are so few women in this industry, especially at the top, it needs to be addressed,” says Anita, 47, pointing out that people need to think about how they are raising and educating kids from schools to the media about gender roles. The deficit of women in professional kitchens and owning restaurants isn’t because there is a lack of women attending culinary schools. This isn’t 1950s Le Cordon Bleu where Julia Child was the lone female in the professional culinary classes. She believes that one of the issues is that there aren’t very many role models. She carefully selected her battles and stayed focused on the food. In her own way, she celebrates herself and women. 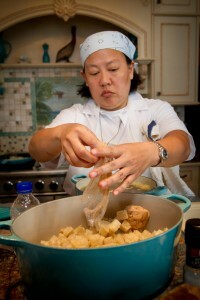 As the mastermind owner and executive chef behind one of New York’s top rated restaurants, Annisa (13 Barrow Street, 212-741-6699, AnnisaRestaurant.com), which means women in Arabic, she purposefully also selected women vintners to feature on the restaurant’s wine list. Anita counts one of her biggest successes not only opening Annisa since it opened in 2000, but reopening the restaurant after a kitchen fire that threatened the life of the restaurant in 2009. Annisa closed for nine months. It was a challenging period, but nearly a year later the restaurant reopened with nearly all of its 23 employees returning. In 2010, Anita bought out her then business and life partner. Anita has since moved on and has been seeing another chef for a little more than a year now. She declined speaking about her girlfriend preferring to honor her privacy. Anita was fresh from a six-day exploratory Alaskan trip when Girls That Roam caught up with her. She was in Alaska checking out the fisheries and fishing with a group of food journalists and other chefs courtesy of the Alaska Seafood Council, which she is also a board member on the council. She was seriously impressed with Alaska’s fishy offerings. “It was really impressive,” says Anita about the management and the sustainability of the fisheries. If Anita could travel the world fishing and cooking she would. Inspirations from her adventures often end up being served to her guests with her own special twist at Annisa. She brought back a pepper from her journey to Senegal that she is currently using in a dish. Not all of her dishes on her menu are immediately influenced by her travels. “Sometimes you get the idea and it doesn’t get fruition for a couple of years,” she says, talking about a Turkish inspired desert that took some time to appear on her menu. Peppering her dishes with flavors of the world actually makes her menu American, at least in her mind. 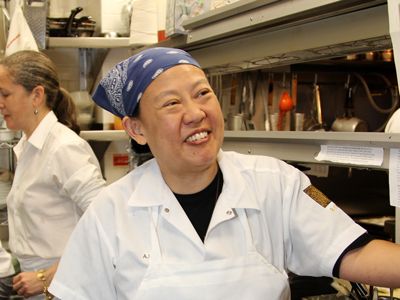 Anita, who is a second generation Chinese-American born in Michigan, vision of American cuisine is very multicultural, which “reflects this very large nation that was built by immigrants,” she says. Anita should know, she’s traveled widely throughout the states all of her life. She loves exploring the world. “We traveled a lot as kids,” says Anita, who got an early taste for exploring the world popping in and out of destinations at 24-hour intervals. From brief introductions to longer acquaintances, Anita finds something endearing and unique about each destination she’s been to, she says. “I can’t even think of one place that I wouldn’t want to go back to,” says Anita, who begins adding cities and countries from Africa to Central and South America to Europe and around the U.S. that she’s been to as if she’s preparing a dish to serve up. 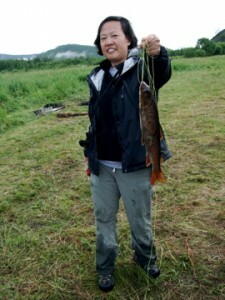 She is dying to return to Japan to go fishing on the countryside. Even in the U.S. there are many places that she would like to continue to explore. Chicago never gets old for her in spite of her many trips to the Windy City as a member of the Culinary Roundtable there. 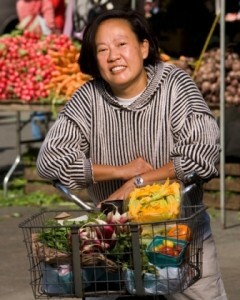 She would also love to return to Seattle and actually catch a fish at Pikes Place Market. She still hasn’t made it to Australia, India, Jordan or Morocco or even Austin, Tex., she says. “I would like to go anywhere that I haven’t been,” Anita concludes. Whenever she lands somewhere the first thing she likes exploring is a city’s market — be it a farmer’s market, grocery store, or open air market place. It’s hard to stay away from food when you grow up in a family that has an overwhelming passion for all things gastronomic. Add in the fact that she was in Paris, France at the time earning her degree in French at Reid Hall, Columbia University’s French language institute, and it is almost a, “Oh, well that explains it all,” moment. “I always loved to eat and I was studying French at the time,” Anita continues. It doesn’t hurt that food is everywhere, chefs are revered, and her older sister cleared the path with her tales of her adventures of studying and taking cooking classes in France. “I ended up taking some cooking classes and fell in love with it,” says Anita, who thought the cooking classes would be a good way for her to keep up her French skills. That is how she discovered and evolved into a renowned chef. She earned her chopping skills at the prestigious Ecole Ritz-Escoffier and started working at French restaurant Bouley (163 Duane Street, 212-964-2525, DavidBouley.com) in New York City. Posted September 9th, 2013 & filed under Entertainment.